SCF Board member Charles Akers accepts the Pro Patria Award. Pictured left to right: Patty Wilbanks, Employer Support of the Guard and Reserve Alaska state chair; Vanessa James-Proud, SCF health benefits specialist; Charles Akers; Sergeant Andrew Hinkler; and Brigadier General Laurel Hummel, Alaska National Guard Adjutant General and Commissioner of the Department of Military and Veteran’s Affairs. Whether helping rebuild after a natural disaster or getting recalled to active duty during a conflict, those serving in the National Guard and Reserves are true unsung heroes. Southcentral Foundation appreciates the values, leadership, and unique skills service members bring to the workforce. 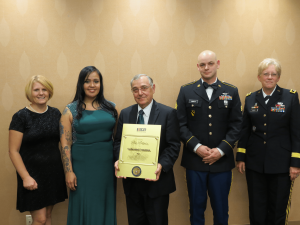 SCF was honored with a Pro Patria award — the highest state award a business can receive — by the Alaska Employer Support of the Guard and Reserve. It was presented on behalf of the men and women of America’s reserve forces for outstanding service to the national defense through continuing support of the National Guard and Reserve. SCF Board member Charles Akers accepted the award. SCF proudly supports its employees who fulfill their military obligations. SCF’s commitment to the Guard and Reserves is unwavering. ESGR is a Department of Defense office that develops and promotes employer support for Guard and Reserve service by advocating relevant initiatives, recognizing outstanding support, increasing awareness of applicable laws, and resolving conflict between employers and Service members. It is comprised of dedicated and trained volunteers and staff.